It’s all down to something called ‘cork taint’, a process by which a chemical called 2,4,6-trichloroanisole (TCA), which is present in some corks, spoils wine by making it musty and undrinkable. You might be wondering what all the fuss is about, and indeed, cork taint is not harmful or dangerous, it merely spoils the taste of the wine. Then again, in the wine trade that is seen as a very serious issue indeed. Cork taint is nothing new, but it has been brought to the fore by the increasingly commercial and global nature of the wine industry and its need to keep an ever-growing market happy. It is said to affect between two and five per cent of bottles, although in my own experience I’d say one in a hundred is closer to the mark. Even so, the issue is serious enough to convince wine producers to start deserting cork en masse for newly conjured synthetic stoppers. The result has been a bitter war of words between those in favour of traditional natural cork and those who wish to see it replaced with plastic. A good measure of this is the fact that in Australia and New Zealand, where the anti-cork movement started, synthetic corks and screw top covers have taken around 70 per cent of the market in under a decade. Even in more traditional markets like France, Spain, Italy and Portugal, cork is starting to lose ground to the plastic invasion, but what are the alternatives and are they really better than the original? There are three main alternatives to natural cork, including agglomerates of natural cork chippings or pulp held together with resinous glue, plastic surrogate corks shaped to look like the real thing, and the screw tops (or ROTE, as they are sometimes called) that have taken the Antipodes by storm. In such regions, still better known for their beer-swilling tradition rather than their wine tasting one, the acceptance of screw tops has been complete, but elsewhere buyers still associate them with cheap plonk. They may have to start getting used to it, though, for although some of the synthetic seals give off a rubber taste, they effectively do solve the problem of cork taint. 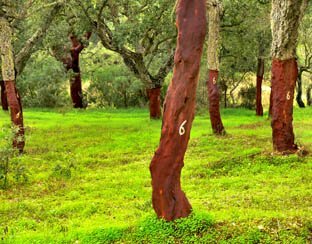 On this basis, the future looks bleak for the Iberian cork oak, yet it’s not as simple as that, as screw tops have proved such effective seals that they actually hamper the ageing process of good red wines and render them lacking in taste altogether. The rational answer, therefore, seems to be that screw tops are indeed the best way to seal bottles of white wine that are likely to be opened soon after purchase, while quality reds are still best served by traditional corks. Those who think the plastic industry’s response is the high-tech option are mistaken; it’s merely a plug-in to the machinery of one of the world’s largest and most wasteful sectors, which thanks to wine taint now has another growth sector to explore. The response of the cork industry, on the other hand, has been characteristically slow, but they are now fighting back with high-tech production techniques that they hope will enable them to produce corks that are virtually taint-free. 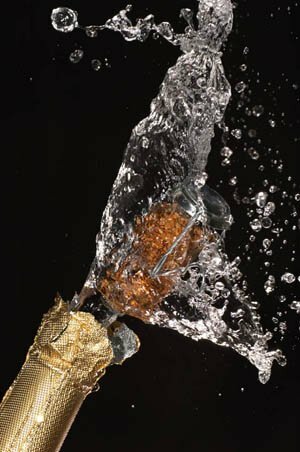 To this end Sabaté, the world’s largest cork producer, has enlisted the help of the French Atomic Energy Commission to develop a patented production system called Diamant, whose highly complex carbon dioxide extraction process reduces the occurrence of taint-causing TCA by 97 per cent. Like Amorim, the Portuguese manufacturer whose recently launched ROSA system relies on a steam extraction system that lowers TCA levels by 60-70 per cent, Sabaté will only know if the technique is successful once it has been applied to a mass-production scenario. Since this is still a couple of years away, the jury is still out as to which form of bottle seal will ultimately prove to be the best. If the Diamant and ROSA systems prove as effective in full production as they have in trials, the cork manufacturers stand a very good chance of regaining their market. Ultimately, it seems a lot of fuss over a silly subject, and indeed it would be—with all due respect to wine aficionados and bottle top enthusiasts everywhere—were it not for the fact that the effect of this debate stretches far beyond the topic of wine and corks alone. At the heart, this is exactly the kind of technical/industrial/commercial issue with a moral/environmental dilemma that we are going to be facing more and more in the future. Many in the wine trade seem to care only about the quality of their wine and the levels of loss, but in their epic search for the most effective bottle stopper they are in danger of arrogantly dismissing the economical and environmental impact of their choices. It seems ludicrous to condemn a noble and ancient industry, not to mention whole tracts of Mediterranean countryside, to death all because a few in a hundred bottles become musty. The days of blissful ignorance are over; too many industries have acted only with their own interests in mind and brought us to where we are today, in a world that needs to set its priorities and make the compromises necessary to keep our environment liveable. In the case of the wine industry this means looking for solutions to the issue of cork taint, by all means, but ultimately it cannot justify replacing a clean, natural product with yet more of the polluting plastic that already chokes up our planet and threatens to strangle it altogether. This entry was posted on Monday, July 7th, 2008 at 11:13 am	and is filed under Copywriting, Environment, Freelance Writing, Social Issues. You can follow any responses to this entry through the RSS 2.0 feed. Both comments and pings are currently closed.